Mike Moore | The Journal Gazette Komets left wing Gabriel Desjardins looks to take a shot at the net in the first period against the Walleye at Memorial Coliseum on Sunday. Mike Moore | The Journal Gazette Komets left wing Taylor Crunk moves the puck between Walleye defenders in the second period at Memorial Coliseum on Sunday. 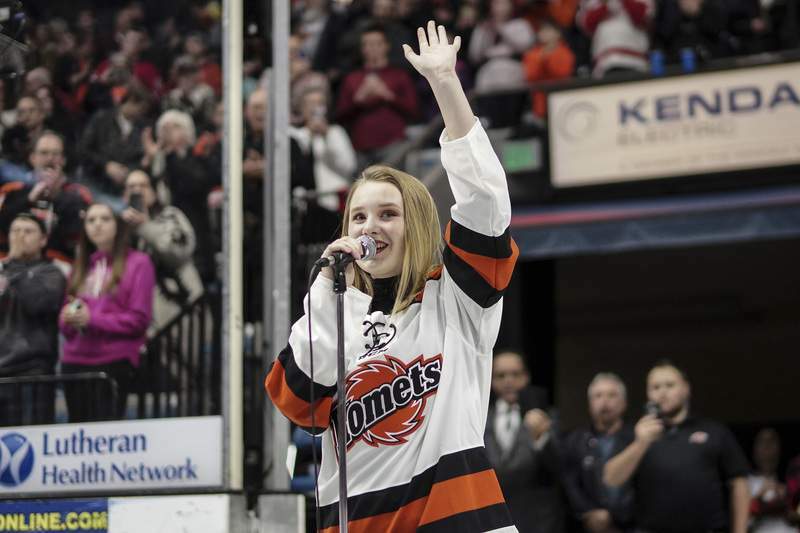 Mike Moore | The Journal Gazette Addison Agen, runner-up on NBC’s “The Voice,” waves at fans after singing the national anthem before the start of the Komets game at Memorial Coliseum on Sunday. Mike Moore | The Journal Gazette Komets forward Justin MacDonald sets up a play in the first period against the Walleye at Memorial Coliseum on Sunday. 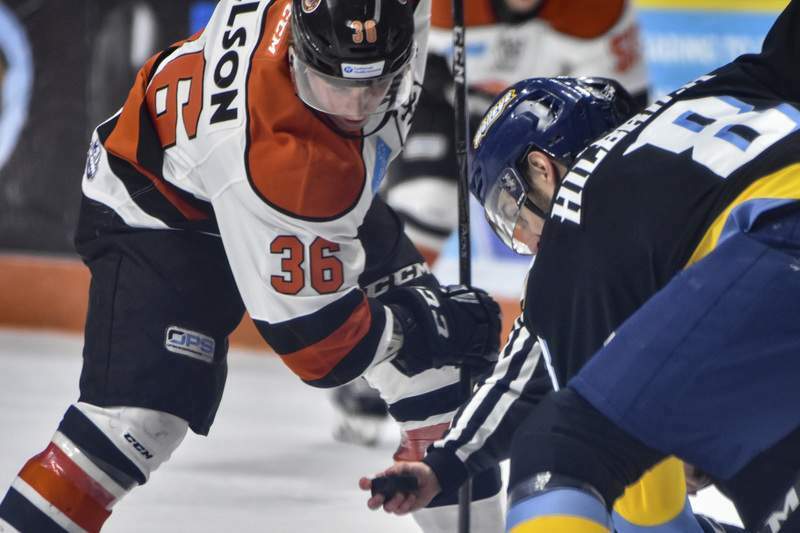 Mike Moore | The Journal Gazette Komets center Logan Nelson and Walleye center Christian Hilbrich face-off in the second period at Memorial Coliseum on Sunday. 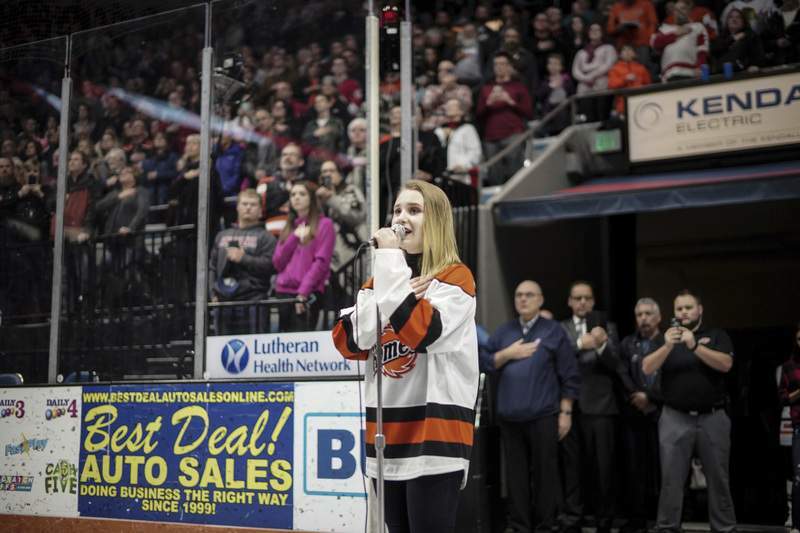 Mike Moore | The Journal Gazette Addison Agen, runner-up on the NBC television show "The Voice" sings the National Anthem in front of an audience at Memorial Coliseum on Sunday. Mike Moore | The Journal Gazette Komets left wing Gabriel Desjardins celebrates after hitting a goal in the second period at Memorial Coliseum on Sunday. Shawn Szydlowski keeps on tearing opponents apart. And so do the Komets. Szydlowski netted two goals and took over the ECHL’s scoring lead. 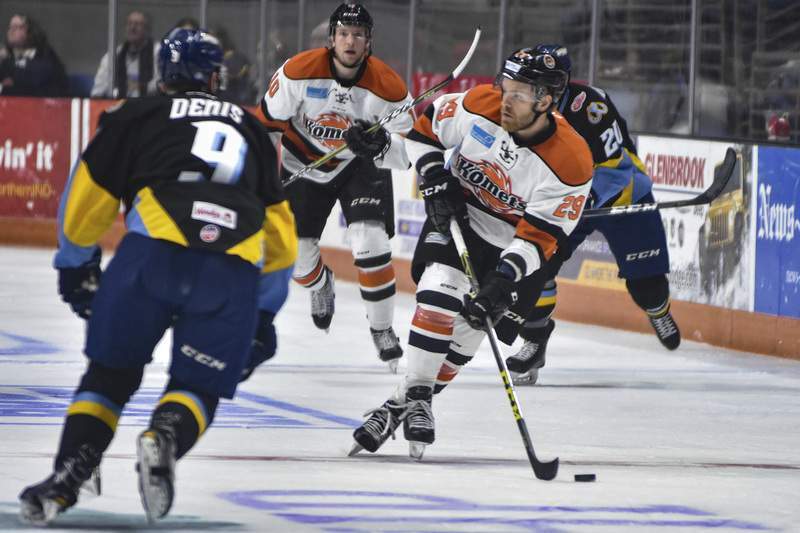 His Komets once again defeated their rivals, the Toledo Walleye, getting a 3-0 New Year’s Eve victory in front of a sellout crowd of 10,479 at Memorial Coliseum. 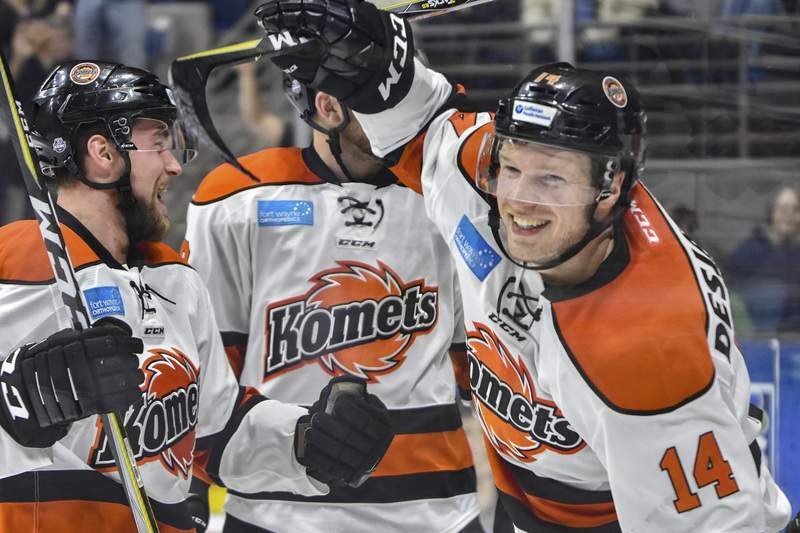 The Komets (20-8-2) have won 15 of their last 18 games, improved to 5-1-0 this season against the Walleye (20-9-3), and climbed to within one point of Toledo for the Central Division lead with two games in hand. Michael Houser stopped 37 shots for the shutout and the Komets haven’t allowed a goal in 126 minutes, 31 seconds of action. Teammate Garrett Bartus had stopped 34 shots in Saturday’s 5-0 victory over the Quad City Mallards in Moline, Illinois. 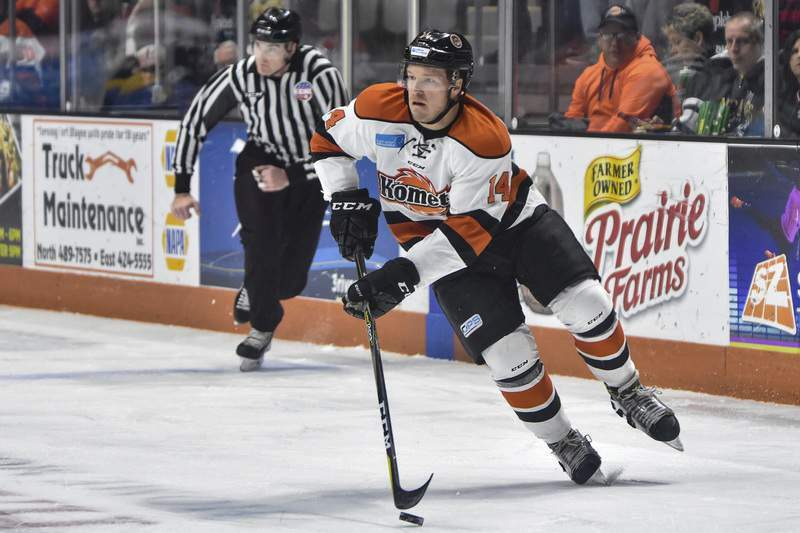 The Komets have won three straight games since Wednesday’s 5-3 loss at Cincinnati, after which coach Gary Graham demanded his players start sacrificing more, and clearly they have answered that call. Szydlowski, who has played 26 games this season, now has 18 goals and 39 points, one more than Colorado’s Michael Joly and Allen’s Casey Pierro-Zabotel, who have both played more often. Szydlowski has at least one point in 19 of his last 21 games. 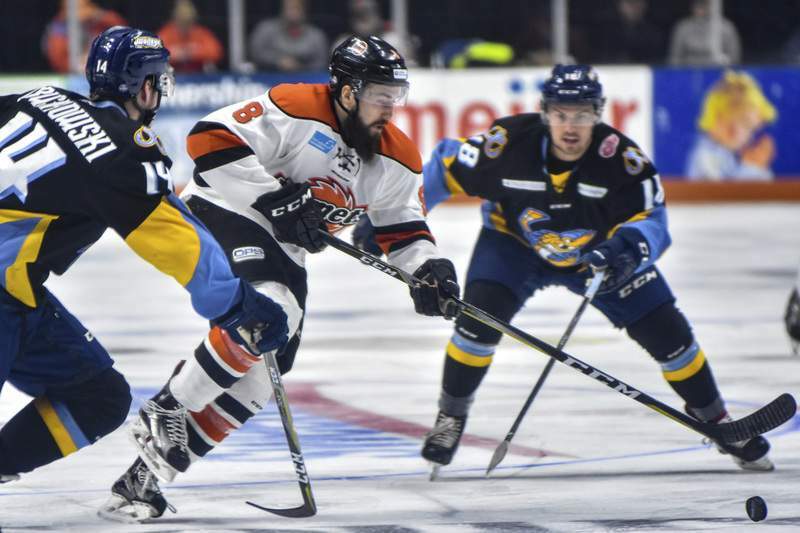 Both the Komets and Walleye were looking to win for the third time in as many nights, and Toledo goalie Matej Machovsky stopped 22 shots in the loss as Pat Nagle was again on the bench against his former team. Szydlowski opened the scoring 3:37 into the second period for the Komets by redirecting a Cody Sol pass from the right circle. Gabriel Desjardins scored at 13:10 for a 2-0 lead, getting to a puck that banked off the left-side boards, and then sending a shot from the circle into the far side of the net. He has three goals and seven points in the last five games. Szydlowski’s second goal of the night came 18:01 into the second period on a shot from the right circle. Notes: The Komets played without captain Jamie Schaafsma (illness), Marco Roy (with Utica of American Hockey League), Artur Tyanulin (Tucson of AHL), Zac Larraza (leg) and Justin Hodgman (shoulder). … Former MLB player and manager Kirk Gibson attended the game. His son, Kevin, plays for the Walleye. … The referee was Liam Sewell.